We're building an AR platform for the ages. 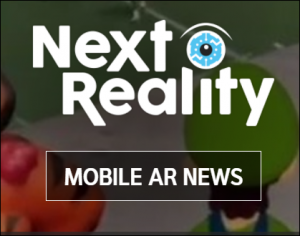 Whether you're just getting started with augmented reality or want to partner with us to build state-of-the-art commercial AR applications, this is the place to find the latest news from Thyng. of our new ARKit app for fun, easy augmented reality authoring! Tom’s Guide including Thyng in a round up of Best AR Apps for iOS. Our famed video wall was highlighted as a sports fan’s dream! 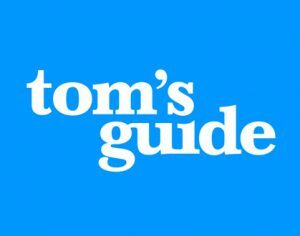 The team over at Tom’s Guide spends countless hours helping consumers decide what tech to buy, showing them how to get the most out of it and solving problems as they arise. Read the full write-up on Tom’s Guide. 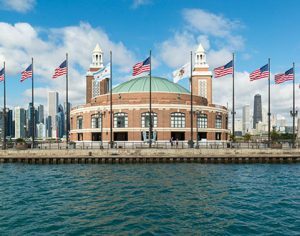 Navy Pier, Illinois’ and Chicago’s most popular tourist attraction, has itself a new app for both Android and iOS devices. Developed in conjunction with Thyng, a Chicago-based digital production agency, Navy Pier’s new app is designed to be of assistance to visitors before and during their trips to the Pier, with trip planning and step-by-step wayfinding among the app’s principal features. Originally opened in 1916, Navy Pier stretches more than six city blocks out into Lake Michigan. More than 9 million people visit the Pier annually. Please visit Chicago Business Journal for more info. 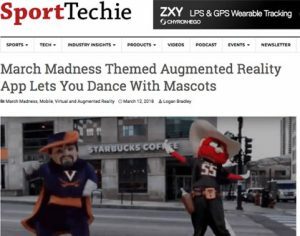 The NCAA College Basketball Tournament, colloquially known as March Madness, is arguably the most exciting postseason format in US sports, and the team behind Thyng want to take advantage of the annual event with AR content. The Thyng app for ARKit-compatible iPhones and iPads now features video captures of mascots for eight teams, including the Michigan State University Spartans, University of Virginia Cavaliers, University of Florida Gators, Villanova University Wildcats, Duke University Blue Devils and others, that fans can place in their sports caves as they cheer on their teams. The app also includes 22 team logos as of this writing. 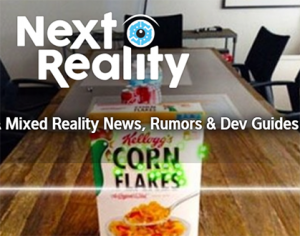 Head over to Next Reality for the full story. There’s no better time to show off your school pride than during March Madness. The NCAA men’s basketball tournament features 68 teams fighting for a national championship. And for fans of each and every one of those teams, Thyng has an augmented reality activation specifically for you. Read the full article on SportTechie to learn more. The world is catching on to the power of target-based AR, one of two powerful AR modes that the Thyng AR platform now supports. 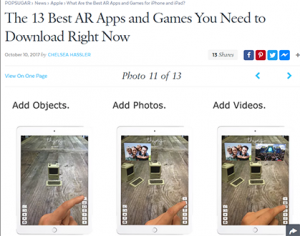 “To create scannable AR content, users just upload the target image and a 10-second video clip to the app’s website. After that, Thyng app users have the ability to scan that image and view the video in AR,” writes Next Reality. Read the full article on the Thyng augmented reality platform to learn more. Will Augmented Reality Be on TV Screens In the Near Future? 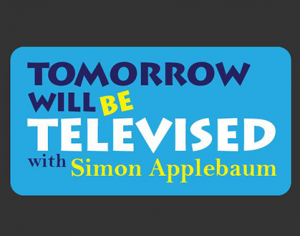 In this Tomorrow Will Be Televised podcast interview, Thyng founder Ed LaHood explains how television and AR are likely to merge together overtime into an entirely new communications medium. There will be three phases to this evolution, and Thyng is already working on two of the likely AR+TV phases with select partners. The interview can be heard here — jump to 29:30 if you prefer to only hear the Thyng interview and not the entire podcast. Developers at Thyng are making homemade augmented reality simple with its ARKit authoring app. The launch of Thyng 4.0 coincides with the recent release of Apple’s iOS 11, meaning anyone with an iPhone or iPad can create their own AR scenes with the ARKit platform. 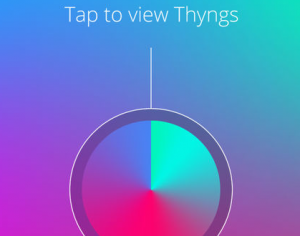 Thyng’s app allows you to use your own personal photos and video. 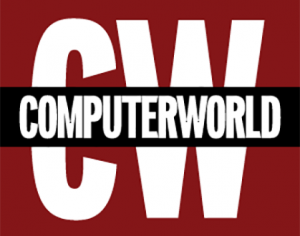 A drag-and-drop interface lets you easily create your own virtual world. Say you were following the Chicago Cubs during their 2017 postseason run; simply drag and drop their logo onto the interface to create your own floating Cubbie banner. Read the article on Sport Techie to get the full story. Thyng is on a quest to bring Augmented Reality to the Masses! Augmented and Virtual Reality have gone mainstream. Andreas Rekdal, of Built in Chicago, highlights the creative freedom Thyng allows its users. Among Thyng’s many features, he notes users can “plan an AR scavenger hunt, build a murder mystery investigation game for your friends or create a guided tour of a city.” Read the full article for more insight on how Thyng will bring Augmented Reality to the masses! 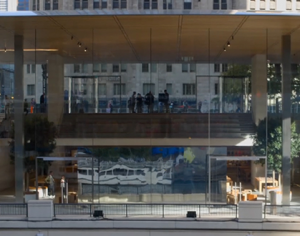 Thyng to Present Interactive AR Session at New Chicago Apple Store! We’re thrilled to be partnering with 1871 and Apple to give a special seminar on Thyng at the new flagship Apple Store in Chicago. This will be an exciting and unique experience where attendees can get hands on with Thyng and experience AR in entirely new ways! Want more details? Check out Apple’s press release about the upcoming Chicago Apple Store in-store event series with 1871 and Thyng. Stop by and say hello to the Thyng team on Monday, November 6! 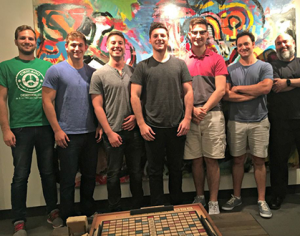 Augmented reality technology startup has a different take on mobile AR and VR applications. 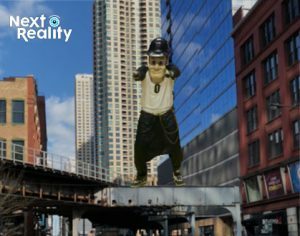 In Chicago, startup Thyng LLC has recently released a general-purpose AR authoring tool that allows its users to create their own personalized AR experiences, adding in their own photos or videos. We connected with Thyng founder and CEO Ed LaHood to hear his thoughts on the prospects for AR apps and what developers need to keep top of mind when coding for the various AR platforms from Apple and Google. Read the full Interview with Thyng CEO Ed LaHood here. Forward-thinking brands are getting excited about AR and Thyng! 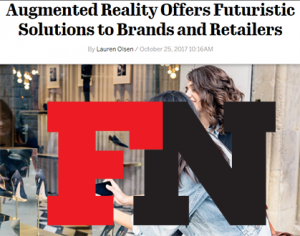 In her article about tech that brands and retailers should be paying attention to, Lauren Olsen of Footwear News writes that “one other technology that should be on everyone’s radar is augmented reality. Ed LaHood, CEO of Thyng LLC, explains why.” Read Lauren’s excellent Q&A article with Thyng founder Ed LaHood to learn how Thyng is helping brands to use AR to improve the customer experience and enhance brand loyalty. At Thyng, we love nothing better than watching a Fortune 500 brand contact us to learn about AR and then quickly go from “Huh?” to “Holy Cow!” — there’s no better feeling than helping big brands to see the future and be part of it. As entertaining and fun as it is, AR isn’t just for games and novelties. 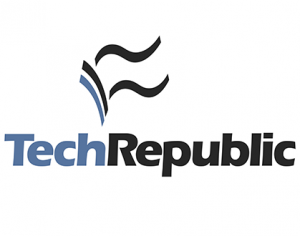 Brandon Vigliarolo of Tech Republic discusses 5 standout business and educational iOS11 AR apps, and we are honored to make his short list. Brandon writes that “companies that want to market products in the AR space can connect with Thyng to turn their products into videos, add “buy now” buttons to them, or anything else.” Right on, Brandon! Some of the world’s most popular brands are already in the concepting and pilot stages of various AR initiatives with us. Get more perspective on the business and educational applications of AR by reading the full article over at the TechRepublic website. 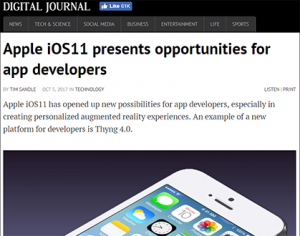 In this Digital Journal article, reporter Tim Sandle keys in on Thyng 4.0 as a great example of how Apple iOS11 is allowing app developers to deploy amazing technology. While much of the attention has been on Thyng’s general-purpose authoring capabilities and how it’s a great way to get started with augmented reality, Tim calls out our appeal to brand managers who want to use AR to push the envelope on creative marketing: “In terms of business applications, the app allows the user to scan a specific product, logo, or image and then quickly initiate a Thyng augmented reality experience overlaid onto the real-world item. As an example, a food manufacturer could scan a cereal box. This would create a recipe video being played on the box.” Read the article on Thyng’s cool Apple iOS11 augmented reality app to get the full story. 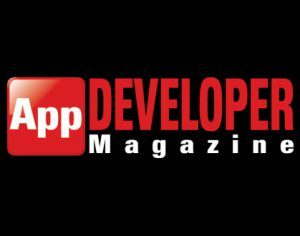 Jonny Evans of ComputerWorld, one of the smartest journalists covering all things Apple, gave us a mention in his article on ARKit app development. Noting that the VR/AR industry will be worth around $108 billion by 2021, Johnny says that “the industry is also seeing some movement toward creating tools that empower consumers to create their own AR experiences,” and links to our press release announcing Thyng 4.0. While our AR authoring app is a big part of our story, we also partner with select developers to give them access to our Thyng AR platform. Sure, AR app coders can start from scratch, but we’ve got a big jump on building out a robust AR platform that supports not only ARKit (surface-based AR) but also our proprietary target-based, brand-friendly AR engine. Want to build the next Pokemon Go or Ikea AR app? We can cut dev time down considerably (think weeks, not months). PopSugar advised its readers on how to master the latest in ubercool tech and steered them our way. They listed 13 great AR apps and included Thyng 4.0 on the list. Regarding AR, they note that “with the release of Apple’s iOS 11, the ability to use it comes standard on every Apple device – and it’s high time we all start using the rad new technology we’ve got at our fingertips more often.” We’re honored to make their short list. Thanks, PopSugar! 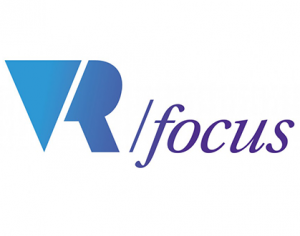 Rebecca Hills-Duty of VRFocus discusses all the excitement about AR and concludes that Thyng 4.0 might be the best way for mere mortals to get in on the action: “What about smaller companies or individuals who wish to build an AR experience? Thyng 4.0 might be the answer.” Our Thyng 4.0 augmented reality authoring app was built with that exact goal in mind. Check out the full VRFocus article on Thyng 4.0 augmented reality authoring to get more details. They’ve got a great site for anyone interested in creating VR and AR content. 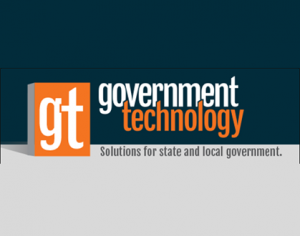 Government and Technology magazine addresses the topic of AR’s use in emergency management. When it comes to natural disasters, epidemics and terrorist acts, how can AR be of service? Contributor Eric Holderman points to Thyng 4.0 to start this conversation with his readers, challenging them to think about how to use AR tools like Thyng in emergency management functions. He mentions emergency training and exercises as one likely instance where AR and Thyng might help. Absolutely. That’s a great way to use Thyng’s AR platform! 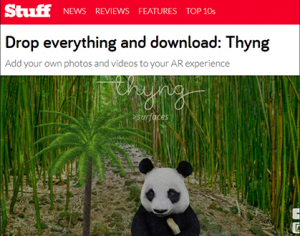 Our Thyng 4.0 AR authoring app gets a great review from Stuff, the world’s best-selling gadget magazine. Erna Mahyuni writes that Thyng is a “great way to inspire budding AR creators into creating their own VR experiences, getting a feel of what AR is capable of right now.” Read the Thyng 4.0 AR Authoring App Review to get more of Erna’s views on Thyng, and we hope you’ll follow Stuff’s sage advice and drop everything to download Thyng. Great stuff, Stuff! 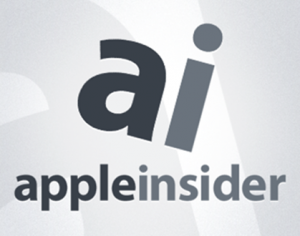 Our friends at Apple Insider like what we are doing at Thyng! Reporter Mike Wuerthele covers the launch of Thyng 4.0 writing that “No development tools or content import is required to use the app. 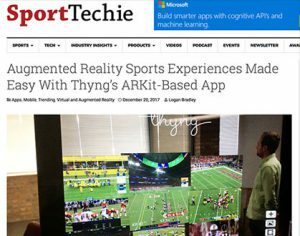 Content to be applied in Augmented Reality is selected from Photo albums or stored videos.” Read Mike’s article on our Thyng 4.0 ARKit Authoring App to get the full story. Thanks, Apple Insider. Stay tuned as the best is yet to come! LearnExpress interviews Thyng founder Ed LaHood, covering a range of AR-focused topics. 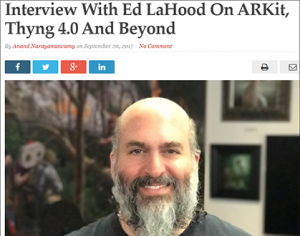 In advance of the release of the Thyng 4.0 ARKit authoring app, LaHood discusses the practical applications of AR, the implications of Apple’s ARKit on AR platform vendors like Thyng, Thyng’s role in the fast-evolving world of AR and answers a host of other questions from journalist Anand Narayanaswamy on the subject of augmented reality. You can read the full Thyng augmented reality (AR) article to learn more. AR expert and talented Next Reality contributor Tommy Palladino covers our new ARKit authoring app, Thyng 4.0. The article highlights Thyng’s new support for Apple iOS11 and ARKit, calling out Thyng users’ ability to “place their own photos and videos, as well as 3D animations from brands, in the real world” as an important feature in our AR authoring tool. Palladino also notes our unique support for both surface-based and target-based AR. Read the article to learn more about Thyng’s unique support for augmented reality. To get started with AR and Thyng 4.0, go to the Apple store for our Thyng ARKit Authoring App and start bringing Thyngs to life! the commercial use of AR and the evolving market for AR platforms like Thyng. We welcome any and all inquiries from the media, bloggers, analysts and influencers. Whether you cover AR, branding, marketing, Apple, Google, ARKit, ARCore, next-generation technology, messaging & communications, consumer devices, social media, a niche vertical or broader topics related to the innovative use of AR to solve business challenges, we're here to help. FUN FACT: Thyng's roots in VR and AR date back to the nineties. We love talking about AR, and we've got the answers to all your questions. Get in touch to learn about Thyng's role in the space: helping everyone to get started with AR with our powerful, scalable AR platform. We're on a mission to transform communication, experiential marketing, brand experiences and social media. It's a BIG vision and we're happy to share it with you! Email us at info@thyng.com to set up an interview. ThyngIt Video on YouTube - Video that explains our new ThyngIt features. Can embed on a media website or use for broadcast journalism. MyThyngs-Personalized-AR-Asset-Libraries.zip - Showcases our new feature that allows business and consumers to upload their own 3D objects, photos and videos for use in AR authoring. ThyngChannels-AR-Private-Public-Asset-Sharing.zip - Highlights the new ability to publicly or privately share consumer/business AR media assets. ThyngTargets-Create-Real-World-Interactivity.zip - Screenshot depicting our ability to build AR interactivity into real-world AR images and objects. ThyngLinks-AR-Interactivity.zip - Powerful new feature in ThyngIt suite allows objects to launch websites or trigger Cloud-based applications to run. 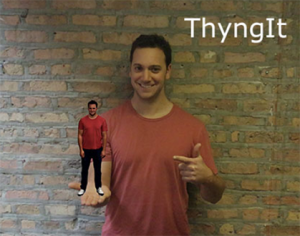 ThyngMe-3D-Body-Scans.zip - New service offering lets consumers get full-body 3D scans. ThyngProducts-3D-Product-Line-Scans.zip - Thyng now partners with companies to create 3D scans of all their products or trial AR use with a select group of scanned products. Thyng-Founder-and-CEO-Ed-LaHood-Headshot.zip - Headshot of Thyng, LLC founder and CEO Ed LaHood. Thyng-ARKit-99-Bottles.zip - Before and after screenshots, showing an empty table that gets filled with AR beer bottles. Thyng-ARKit-Game-Day.zip - Before and after screenshots, showing an array of AR TVs showing football games. Thyng-ARKit-Human-Chess.zip - Before and after screenshots, demonstrating the potential of AR to power novel 3D games. Thyng-ARKit-Office-Picnic.zip - Four screenshots, highlighting the ability to include branded products in an AR experience and interactively show videos on top of branded products within an AR scene.